Re: crucial m4 64GB to raid or not to raid? crucial m4 64GB to raid or not to raid? I recently purchase two crucial m4 64gb ssd's. I know once I raid 0 these drives I will lose trim support. I was wondering, if trim is that big of a deal or should I just use only one m4 ssd on my computer and throw the other on my laptop? I also know that the ssd does have garbage collection, will garbage collection still work in raid mode? Also, I have an iso of partmagic. If for any reason in the future I notcie a performance decrease can I use this software to wipe the hard drive clean in order to bring it back to its factory state? i would raid the 64s, unless you would like your laptop to have a drive also. the GC on the drives works super in raid. unkie other manufacturers drives, the crucial drives do not degrade to the point you need to erase them, but you would want to have the parted magic for when you may want to reinstall to/redo the array stripe to the ssds (i just did this this afternoon, as i was testing different stripe sizes. 64k stripe seems to be a sweet spot). I completely forgot about GC. I built quite a few system using two c300s in R0 in the past and I haven't gotten a single complaint from anyone of my friends or family. They're all holding up very well too. 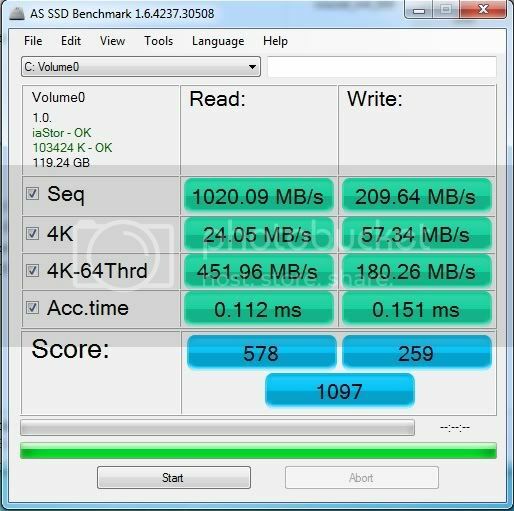 At the momment I decided to test how fast a single m4 64gb ssd feels like on my new system. So far it seems to be decent. i'm not totally impress yet but then again I'm running into some issues with my read speeds on SataIII. I figure I bump this and ask how you're going with no trim? I'm looking at doing RAID0 with my 256GB and just want to make sure I can keep avoiding Secure Erase etc (having a working SSD makes you lazy!). Would the stripe size of 64 still apply for this size or I should check it myself using something like AS-SSD? GC is all you need to maintain performance guys. I would have zero concerns about having to continually use some program to bring back performance, not needed. R0 those drives and run them like you stole them.